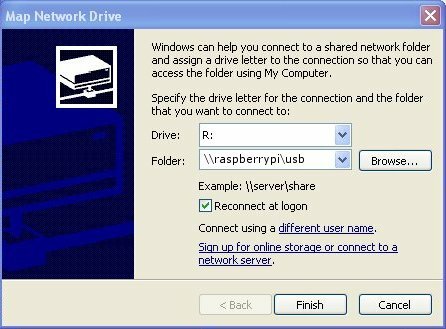 Ok this instruction sheet will allow you to setup a Raspberry Pi computer to act as a (NAS)Network Addressed Storage server so it will be possible for you to access files from any/all your windows PC's in your house using the Raspberry Pi to share the files on a disk drive attached to one of the usb ports on the Raspberry Pi. lots of stuff will fly up the screen so wait until finished, then repeat until nothing else updates - agree y to any y/n questions. NOTE:- The disk drives that I will be attaching will be formatted in windows format - either FAT32 or NTFS, I suggest you do this with a Windows PC and check the drives are readable by the PC before attaching to the Pi, and also add a test file so that you can see this while testing. You can use unix formatted drives but the FAT/NTFS file systems will make the drives portable in case of a Pi failure. This will show all the details of the attached disks even if you are not yet using or are able to access them. I have attached a 4Gb usb card to my Pi for my file server bits from the command is shown below - i have left out stuff not relevent for this How2SetUp. From the above listing you can see that I have a disk /dev/mmcblk0 (the SD Card) which contains 2 partitions - so this is the operating system disk. I also have a disk /dev/sd1 that is a 4Gb usb card with 1 partition but this time its been formatted in a windows FAT32 format - old style formatted. All the disk drives and partitions attached to the Pi are shown, they are all given a device address such as /dev/sda with a partiton 1 so /dev/sda1 is the card in the first Pi usb port and is partition 1. 4. Now we need to make the disks available to the operating system so we need to create a point in the filesystem to mount the disks on. To do this we need to find a directory that the disk can be attached to, so in the example below we will use the default media folder on the Pi /media then use /media/usb1 for the 1st Disk and /media/usb2 for the second. The above commands have made 2 new directories for us to use. 5. Now we need to attach the disks to these folders so we have to edit the /etc/fstab file that is used my the operating system on bootup to connect the physical disks to the filesystem. We need to add the bottom 2 lines for the 2 disk drives, please note that the entry vfat or ntfs-3g is dependant on your disk type and should be modified accordingly. 6. Now we need to install a software package called samba which will allow a unix box to share windows files. Now you will need to install these utility packages. 7. When all is complete then the samba package has been installed so will need configuring for your setup, so you will need to edit the /etc/samba/smb.conf file. The things that possibly need changing are the workgroup entry set to WORKGROUP for XP and previous operating systems and HOME for Windows 7 and above (not sure what is the default for Vista). Then i would comment out the following lines by adding a ; to the front of the item as this makes initial setup and testing easier. Now remove the comment Then finally at the end add your windows share name - i will use a share name of usb and will share out the content of /media/usb1 - to share the other disk, add another entry as below with the share name within the [ ] and the path to the other disk drive. rlimit_max: increasing rlimit_max (1024) to minimum Windows limit (16384) Processing section "[usb]"
This will add a pi user with the password you typed in for windows to connect with. Now try connecting to the server using windows map network drive. On Windows XP you will see the following. So type \\raspberrypi\usb in the Folder field. Now click on the [Connect using a different user name] link and enter raspberrypi\pi in the user name field and raspberry in the password field. NOTE: windows will always by default try your username and password from your PC to make the connection (in my case my PC is called VNET and my username is simon so you see VNET\simon in the window), and as we only have the one user on the Raspberry Pi, we have to specify that the user connecting is one that exists on the Pi. We also have to also specify the machine that the user is on before the user name therefore the username is raspberrypi\pi. Then click [OK] which will close the pop-up and [Finish], this should now map your drive to the Raspberry Pi NAS server. windows pc's that are in the LAN. If you dont want your server called raspberrypi then change its name by reading "How2Setup Rename my Pi".